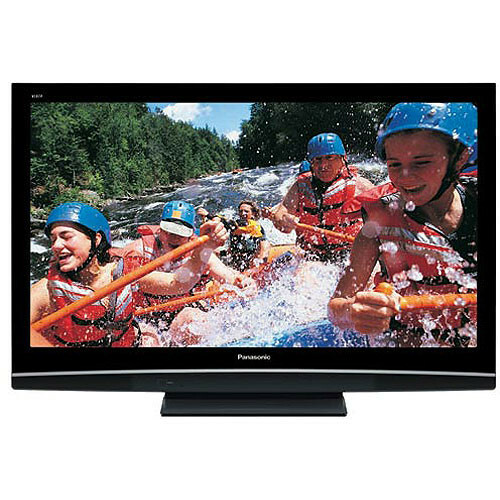 The TH-50PX80U VIERA Plasma 50" (49.9" Diagonal) TV from Panasonic can be the cornerstone of your home theater. This stylish screen features 720p resolution with a native contrast ratio of 15,000:1 for crisp, detailed imagery. With its 3 HDMI ports, this plasma screen is ready for all your HD gear with one-cable pure digital connections. The SD slot will allow for instant slideshows in widescreen of your favorite JPEGs. The TH-50PX80U also features VIERA link HDAVI control of your other "HDAVI Control" equipped components when connected via HDMI. The anti-reflective filter allows for viewing in rooms with abundant ambient light. A special game mode is available for when using this plasma screen with your gaming system. The integrated SD card slot can be used together with Panasonic's GalleryPlayer to display your photos, as well as high definition art and photography on your HDTV. Image realism is strongly linked to contrast ratio and Panasonic provides you with a 15,000:1 ratio, giving you an amazing 29 billion colors for realism beyond your wildest dreams. The contrast ratio doesn't only provide excellent colors; it also enhances dark and light scenes by boosting the contrast level giving you crystal sharp clarity. High-definition programming is received through the HDTV tuner and comes through with stunning clarity and crisp definition. Panasonic's high pixel count enhances the HDTV-quality giving you fine details and smooth edges. The integrated ATSC/QAM/NTSC tuner will receive terrestrial and cable/satellite digital signals. With HDMI technology you organize your home theater by removing the bundle of cables connecting audio and video. One cable carries both digital audio and video signals without losing any of the quality. The TH-50PX80U has 3 HDMI inputs. Theater-designed, width-to-height ratio makes this plasma display the closest thing to having an actual movie screen in your home. The anti-glare coating reduces glare caused by light without compromising on color and clarity.